A while ago, I wrote about the importance of knowing simple arithmetic, how I taught math in a second-year fundamentals of reporting course at Carleton University’s journalism school. In that blog post, I wrote that simple mathematical errors can damage credibility and lead a reader to lose focus on the whole report. 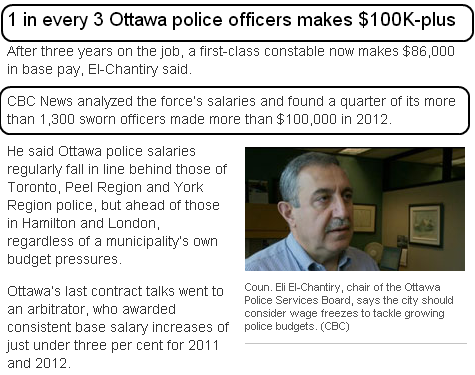 A perfect example was today’s report from CBC Ottawa on its analysis of police salaries in the city. The oval highlights are mine. Please tell me you can spot the error.